Leigh's Fiber Journal: Snowball, Star, or Snowflake? This is the next section of the same draft as the pine trees. It is the sort of motif that seems to be common with the pine tree draft. My question is,what is it? Different drafts of the same sort sometimes call them "snowballs" also "roses." I'm not sure what this one looks like. Certainly not a snowball, and doubtful it looks like a rose. Maybe more of a star or a snowflake (my terms), but not quite. At any rate, they use the same threading draft as the pine trees; they are simply treadled differently. I like the way this version looks (from Carol Strickler's A Weaver's Book of 8-Shaft Patterns, #549 page 155), and if you're glancing at it from your galloping horse, you won't notice the treadling error. Nor the inconsistent beat. My plan for this table runner is to weave three of these in between pine tree borders. Can't wait to see the finished runner, it looks great in pieces. Very cool. Can't wait to see the finished product! It's a beautiful motif, and I agree that it looks more like a snowflake to me. I am sure it will look stunning when it's done! I always thought star and rose were two general categories for block designs like this. My guess is that it is considered part of the rose category because of the design looks more like an "O" than an "X". I would need to go looking through my books. Snowflake sounds good though. With the pine trees, the design makes me think of a ski lodge. Very pretty. At first glace I was going to say snowflake, I don't see a rose at all. Its looking really nice I can't wait to see it done. I see frost on the windowpane. But that might have something to do with its being square and the fact that it is so cold here I can think of nothing but frosty windows. Either way, it's awfully pretty. Nice work! 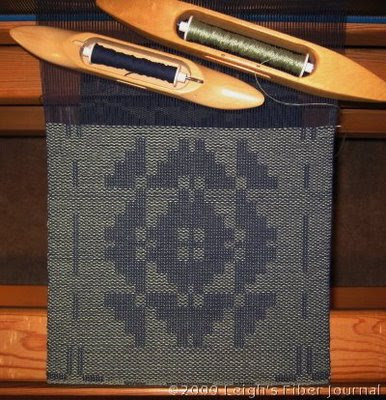 Some times I wonder where a lot of the names for weavings come from. More like a snowball. No matter what it's name it certainly is very nice. All I can say is I am so jealous of your weaving time. This day off was spent in jillions of errands. I should know by the end of the week if my bid to retire early is accepted. If so, ya better watch out. I'll be trying all your tricks! when i squint my eyes (an artist's trick) it looks like a snowball hitting a window and sort of "exploding" outward. so i clearly understand the snowball reference. but i also like sheepish annie's thoughts on how frost sometimes organizes itself on frozen windows...so, although not quite a snowflake, more like ice crystals. as always, i am highly appreciative that you take the time to share so much of your work and experience. i especially adore the pics of rascal trying to "help"! Hey there Miss Leigh -- on my coverlet, I'm calling it a Pine Tree and Bird's Nest design. I was scouring around places also to pinpoint the pattern name (and these vary from region to region) but did run across this same motif referred to as a bird nest. Star or rose, in classic coverlet motifs refer to the type of treadling. One of which produces a more star like -- and the other a more rounded, or rose-like motif. Makes sense eh? refered to as "Bird's Nest with Pine Tree border"
The runner is going to be gorgeous! I appreciate all the comments! It's fun trying to figure out what the motif looks like. Jane, thanks for sharing this! Very interesting article.